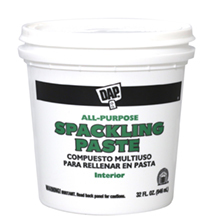 All-purpose, heavyweight spackling compound for repairing and filling cracks and holes in wallboard, drywall, plaster, wood, brick and stone. It spreads smoothly, sands easily and resists cracking for fast professional repairs. Interior/exterior use.